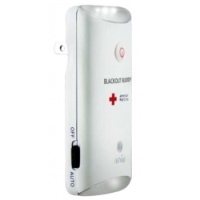 The Blackout Buddy by Eton is a multifunction power failure light. It offers illumination using 3 bright LEDs during power failures, and a convenient 1 LED night light that automatically turns on when charging. This power failure light is always charging while plugged in. When a loss of power is detected the LEDs automatically turn on to light your way. The Blackout Buddy may also be removed from the wall outlet and used as a flashlight. It has three switch options, off, auto, and flashlight. Dimensions: 3.93" long x 2.0 x .75"